Up till now, participants in the fair were mainly craft people from Jávea and de neighbouring villages. To offer those who live further away a better chance to sell and to guarantee the public more variety from one week to the next, it was decided to add an extra day to the fair. From now on you can find the dozen or so stalls also on Saturdays, with the same time table: from 11 am till 2 or 3 pm. Some artesans will be there the whole weekend, others will come only on Saturday or Sunday. Now you have no excuse for not knowing where the market is, because it is now shown in Google Maps. 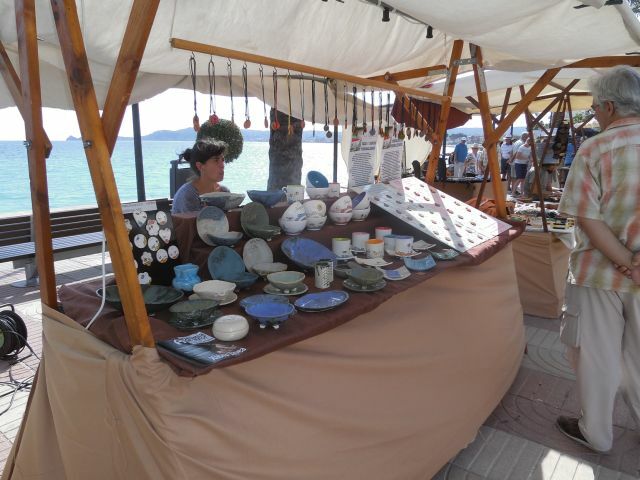 The direct link is https://goo.gl/maps/rx5uWDjHiYs or you can look for “Feria de Artesanía Jávea”. Here you can also check opening hours and look at photographs and news about the fair. Of course the weather is very important for the craft people, because they have to be sure that the rain or the wind doesn’t damage what they have made with so much care and love. So it might happen that one Saturday and/or Sunday, they can´t risk it and that is why they have created a page in Facebook, specially for this fair. At https://www.facebook.com/feriaartesaniajavea/ they will publish every week (normally on Thursday or Friday) a list of which crafts will be present on the next Saturday and/or Sunday. And when there is any doubt about the weather, you can see here, on the day itself!, whether the market is built up or not. To find this page in Facebook you can also look for “Jávea/Xàbia Feria de Artesanía Puerto”.